RTSea Blog: observations on oceans, sharks and nature: Hammerhead Sharks: what was Mother Nature thinking? Hammerhead Sharks: what was Mother Nature thinking? Discovery Channel's Shark Week starts up this Sunday. Know how I know? Easy, just look at all the various shark news items papering the Internet today. From the latest human/shark encounters to updates on various shark fin ban movements or legislation, sharks are stepping in to fill the void of the close of the summer Olympics. The Mother Nature Network posted a quick look at the always curious hammerhead shark. For most folks, great white sharks or tiger sharks can evoke fascination mixed with a little apprehension, but the hammerhead is often the one that leaves them scratching the head in bewilderment. What was Mother Nature thinking when she drew up the plans on that one? For me, there are two questions that come to mind with the nine species of hammerhead sharks. The first is why? The Mother Nature Network examines the three most common explanations and they all revolve around the shark's hunting capabilities, particularly for the larger species which like to include stingrays as one of their favorite prey. The broad head of the hammerhead shark increases the surface area where the shark's electrical sensory organs are located. These gel-filled pores, called Ampullae de Lorenzini, allow the shark to sense the subtle electrical fields given off by animals - as an example, stingrays camouflaged and buried under a thin layer of sand. 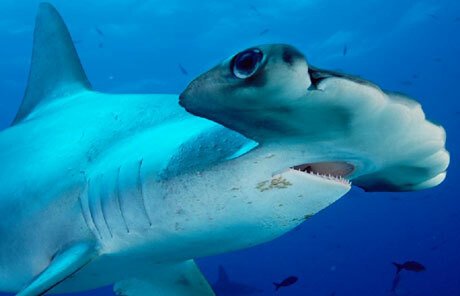 With eyes in each end of its head, the hammerhead is also able to increase both its stereoscopic vision (the ability to see directly forward) and its overall field of view (by swinging its head side-to-side, it is able to see above, below, and behind better than many other shark species). The better the vision, the better the animal is able to hunt. Finally, when hunting for stingrays, the hammerhead shark actually uses its unique shape to help shovel under a buried stingray, flip it over, and even pin it to the bottom. This elaborate ballet that allows the shark a measure of surprise while it bites the stingray's pectoral fins, thereby eliminating the prey's ability to escape, has been documented and is quite something to see. So, those are the three most common explanations as to why - why a hammerhead shark has evolved to have such a unique shape. There's a purpose behind it that proves beneficial to the shark's survival. The second question is a much challenging one to answer: How? We can see why it has this shape and that it benefits its hunting abilities, but how did the evolutionary process start with a "conventional" shaped shark - if, indeed, that was it's original root form - and then Nature said, "Hey, I've got a whacky idea." Evolutionary researchers have seen evidence of the adaptive radiation process, wherein plants and animals adapt to their surroundings and various requirements to ensure survival, and it takes hundreds of thousands of years for most species. But there have been occasional jumps or sudden detours - either radical departures from the norm or greatly accelerated changes. What was the case in the hammerhead shark? What was happening in its surroundings that the gene pool decided to change little by little from one generation to the next, repeatedly, to where it eventually reached the iconic and unusual shape that we see today. Evolution is no simple linear, A to B to C, process. But its underlying motivator, that of survival (of the fittest, the most resourceful, or the smartest) has produced a staggering diversity both on land and at sea. No better example than that of the genus Sphyma: the hammerhead shark.